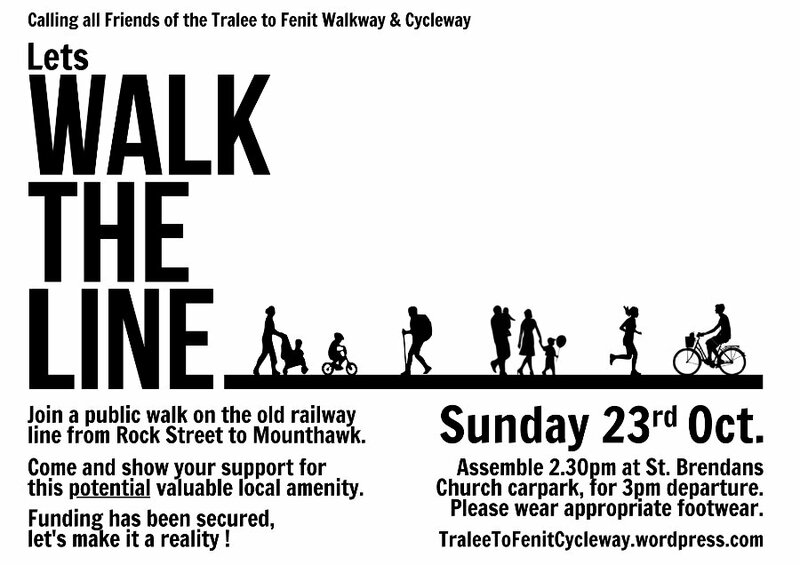 You may have read from Colm’s comment that there will be a walk in support of the Tralee to Fenit pathway taking place Sunday next 23rd of October. It is great to see people come together from different communities along the line, Fenit, Spa and Tralee to promote this great project. So please come out and show your support, assemble at St. Brendan’s church at 2.30pm, the walk will depart at 3pm to Mounthawk. Poster and fliers for the walk are available for download, please print them out and spread the word. I have one question how will we acces the old line at rock street because there is a wall blocking access to the line? I took a short stroll this evening on some of the line and while I enjoyed the experience and the fauna, it is dreadfully overgrown and quite hazardous in places. Well done to all, a very worth while project…. Is walk likely to be called off due to weather? Well said Holger and even though the weather was against us,it was great to see a very good turnout.Time now to press ahead with the project regarding the council and make serious headway. Great news. Would a person be allowed to walk the line at any stage when there is no walk planned? There is probably need for a follow-up walk as soon as possible. People are very enthused and motivated as a result of events on the 23rd, and it might be no harm to reinforce the level of support for the project. Quite right Tomas and as soon as we get an update from the Co.Manager of K.C.C. and the Urban Council Manager,we would hope to hold another ‘Walk The Line’ in the near future. I read in kerry eye that plans to turn the section from rock street to mounthawk first and then all the way to fenit.